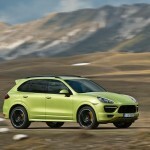 On April 24th, Porsche will unveil their newest high-performance SUV in the form of a 420 horse powered Cayenne GTS. Based on the Cayenne S, the new GTS has 20 more horses than the S version, a 20 mm lower ride height and a lower final drive ration for improved responsiveness. The latest Cayenne transmits power from its 420 hp V8 to an active All-Wheel-Drive system coupled to an eight-speed Tiptronic S transmission with integrated Auto Start Stop function. The specially tuned engine and transmission combination enable the Cayenne GTS to sprint from a standing start to 60 mph in 5.4 seconds and to achieve a top-track-speed of 162 mph. The Cayenne GTS is recognizable from the outside by its high-gloss black trim, prominent side skirts and wider wheel arches as well as the hood and front fascia from the Cayenne Turbo. 20-inch RS Spyder wheels with a unique offset for the GTS are standard. 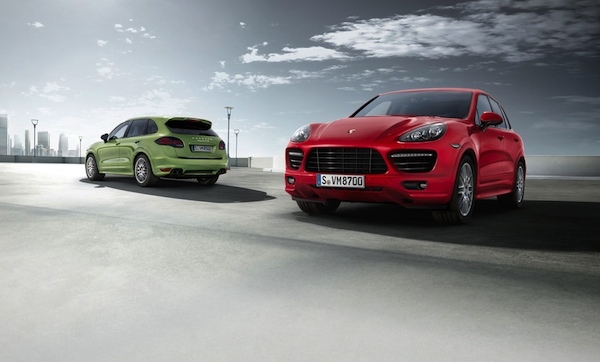 Two new colors are available for the Cayenne GTS; Peridot Metallic and Carmine Red. A sport exhaust system with matte black twin tailpipes is standard. Inside, the Cayenne GTS features exclusive GTS eight-way adjustable front sports seats with Alcantara accents. For the first time in the Cayenne, a new Sport Chrono package is now available to monitor the improved performance offered by the GTS model. Additionally, a Sound Symposer channels authentic engine intake sounds into the cabin. The 2013 Cayenne GTS will go on sale in the U.S. in August 2012, with a base MSRP of $82,050, not including a $975 delivery charge. Build your own on the new Porsche microsite. 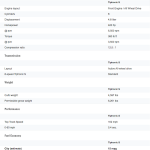 With all due respect to a great SUV, I still think this needs to go on a diet to add lightness and increase fuel efficiency. This is not something new or strange to Porsche engineering. It would also help with towing capacity. I mean, like, how many of us track or show our cars? Methinks there’s a market here. Until then, I’ll continue to take my cars to the track and shows in my Suburban.